My boys love pasta. It is a staple in our house. I love to try new things with pasta. Sometimes I use familiar shapes and other times something different jumps off the shelf at the store. Formaggio al forno e spinaci tortellini, or Baked Cheese and Spinach Tortellini in Italian, is the most recent experiment in our house. 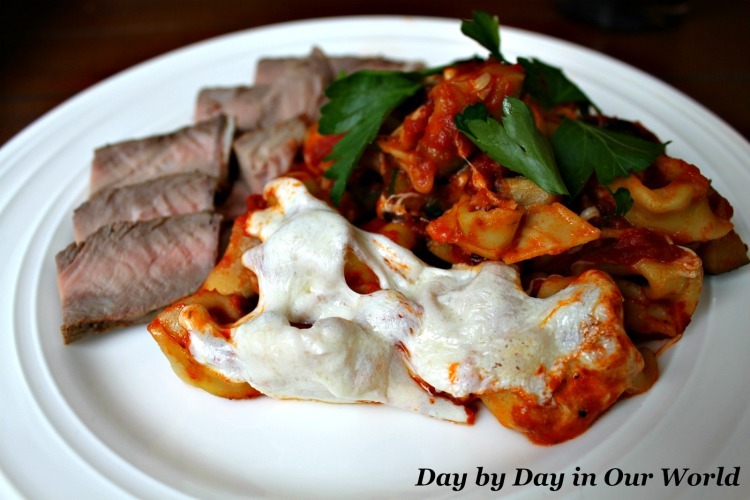 Homestyle cooking is what my family favors and this dish has the feel of rustic Italy. Very fitting given my Italian heritage on my mom’s side! For this dish, I decided to go with a cheese and spinach tortellini which is dry. Tortellini is one pasta I have yet to attempt making with our pasta machine as it is more involved than just running the dough through the machine and cutting. 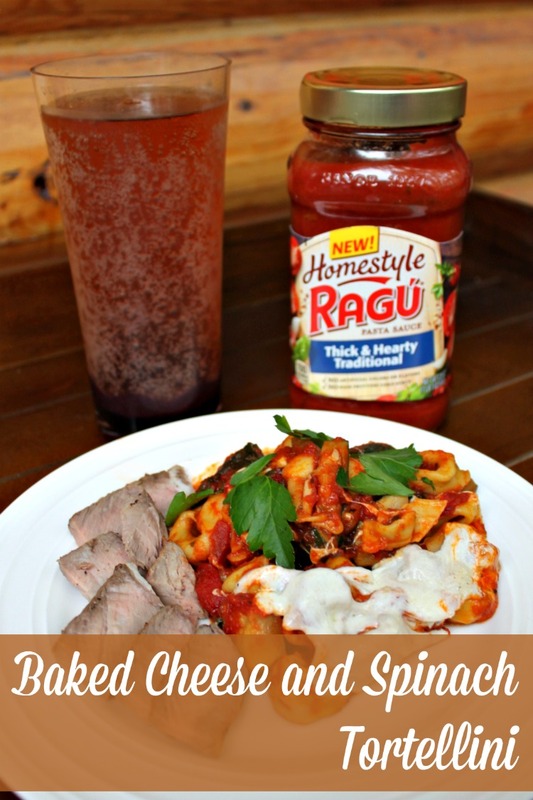 When I was seeking out my ingredients, I knew that I wanted to use the new RAGU Homestyle sauce. Not only is it delicious, but the sauce “hugs” the noodles. I found the Homestyle Thick and Hearty Traditional Sauce at our local Target store. While ours did not offer other varieties, you may find Homestyle Thick and Hearty Meat Sauce, Homestyle Thick and Hearty Four Cheese Sauce, Homestyle Thick and Hearty Roasted Garlic Sauce, or Homestyle Thick and Hearty Mushroom Sauce at your store. Like anything I make in the kitchen, doing the prep work before I start cooking is key. Onion, garlic and zucchini were all diced and put into containers to make it easy to add to the cast iron skillet I used for the entire cooking process. Dried tortellini needs about 10 minutes of cooking. I did all the sauteeing while the pasta cooked. The tortellini finished a little before I was ready for the final mixing. So I tossed the drained pasta with a little olive oil to keep it from sticking together. 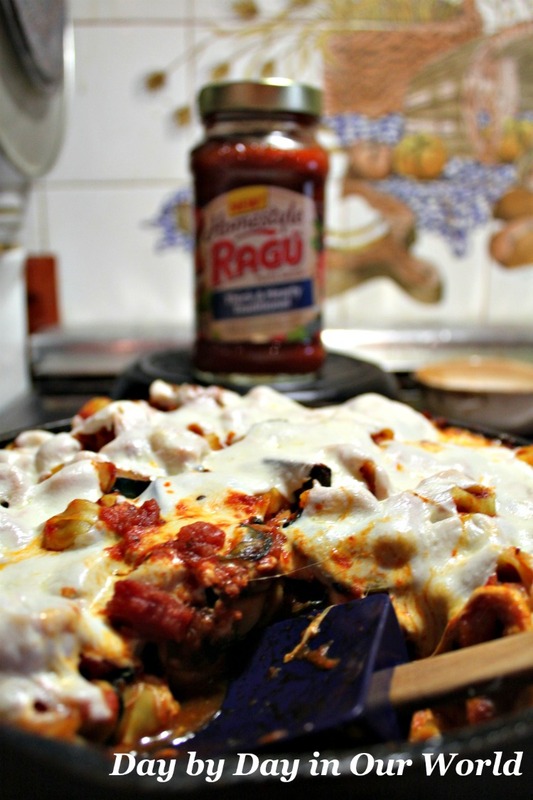 After everything is mixed in the cast iron skillet, you can top with a layer of fresh mozzarella cheese. Then bake it for about 10 minutes in a 350 degree oven. The house smelled heavenly when the Baked Cheese and Spinach Tortellini was pulled from the oven. And, the fresh mozzarella provided a wonderful top layer. Cook the tortellini per package instructions. Drain and lightly oil when it finishes if you are not ready to add to the pan with everything else. In a skillet (I prefer cast iron), saute the onions and garlic in the olive oil. 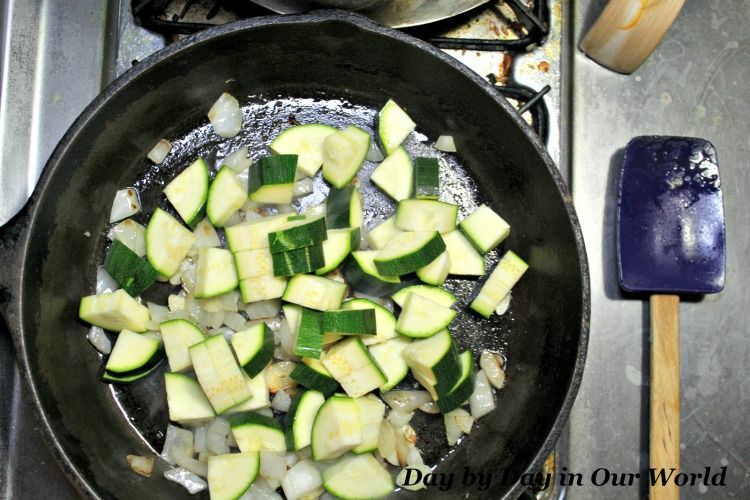 After a few minutes, add the diced zucchini to cook. When the zucchini is starting to soften, add the spinach.. I like to add a small amount of water to the pan at the point and cover it to help the spinach cook down faster. 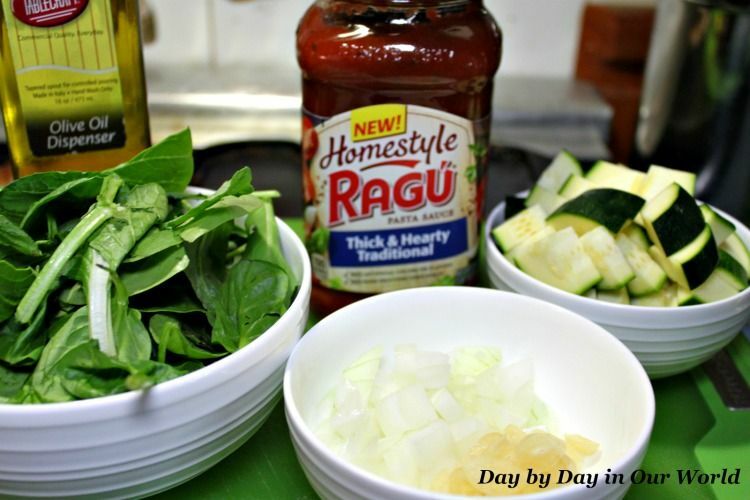 Once the spinach has wilted, add the jar of RAGU Homestyle Sauce. Stir well, and then gently toss the tortellini into the skillet mixture. If you did not use an oven safe skillet, then transfer to a casserole dish. Bake for about 10 minutes, just long enough to melt the cheese. What are some of the dishes that remind you of home? Is pasta a favorite style of pasta in your house? 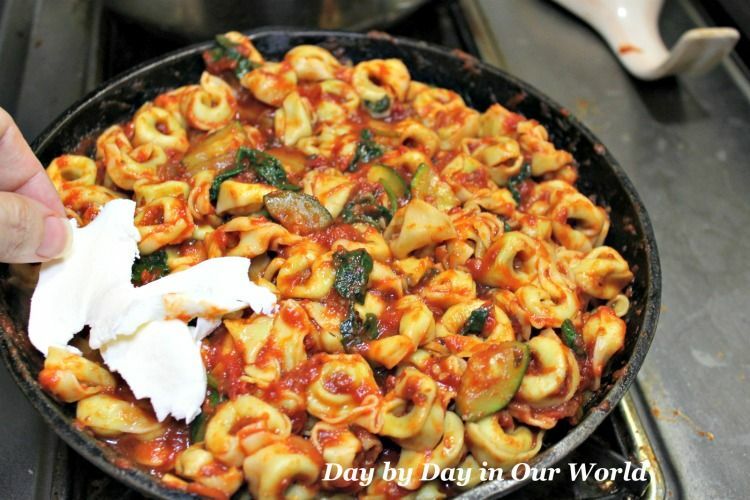 My family loves tortellini, so I need to try this recipe and sneak in some veggies!